Group Discussion Ideas > Environment GD Topics > Climate Change – What can we do about it? A recent NASA study has shaken the entire world with its space-based report that this year, the average rise in the concentration of Carbon Dioxide present in the atmosphere has been stated as the highest compared to the past 20,000 years. With terrorizing facts and figures like accelerating sea levels, melting icebergs and disappearing coastlines, it has become a primary subject of study for scientists and researchers over conserving the climate from its degradation. Leaders of all countries have already started taking a serious interest in this alarming subject. Greenhouse gases like Carbon Dioxide, methane, nitrogen oxide etc are responsible for creating the greenhouse effect on the planet. With the constant rise of this in the atmosphere, the heat trapped is no way escaping hence increasing the average temperature of the earth. Other gases, such as chlorofluorocarbons, trap the heat and is thousand times more lethal than carbon dioxide. CFCs are released by the air conditioners, petrol driven cars etc and largely contributes to the ozone layer depletion. The world now demands more electricity with the exponential growth in science and technology. Coal, natural gas, and oil are the primary fossil fuels widely used to generate power and electricity which in turn releases harmful gases like carbon dioxide. Deforestation is another major concern when it comes to global warming. Trees and plants play a vital role in maintaining the temperature balance and absorbing atmospheric carbon dioxide. 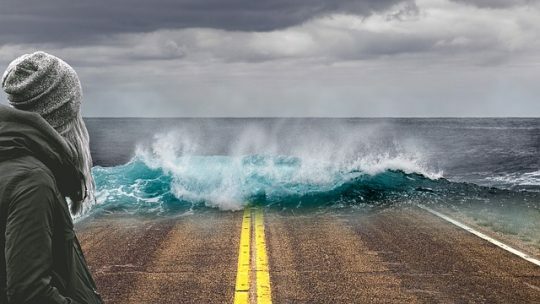 NASA reports recently predict the tremendous rise in the sea level estimated around 8 inches rise which is double the rate estimated last decade. With the rise in average temperature of the earth, there has been a massive shrinking of the snow cover especially in the northern hemisphere of the globe. Extreme climatic conditions have been reported across the world. This variation in the climate pattern is gradual but evident in many parts of the globe. Elongated days and warm winters are some of the unlikely changes occurring in the atmosphere. With the constant increase of carbon dioxide gas in the atmosphere, acidification of oceans has been reported.Seawater has now started absorbing this atmospheric carbon emitted by humans. Ticks carrying Lyme Disease, which is one of the vector-borne disease spreading rapidly in the US. The interesting reason behind this is climate change. With the average temperature rising day by day, US now experiences warm winters where the ticks get highly activated. Paris Agreement: On the 5th of October, 2016, Paris agreement was signed by a total of 171 countries uniting to take a noble pledge of limiting the global warming to 2.7 degrees. Countries like China promising to reach the target by 2020. World seeds Vault has almost 1,35,000 seed deposits generated by scientists around the world. It is said to contain not just the seeds but also the deposits full of genetic code which the scientists can engineer to produce the yield required by the youth during any kind of global climatic despair. Most of the countries, in a recent UN Convention, have agreed to extend their national parks in order to expand the area under protected land to nearly 17 percent. This would also help in the upliftment of endangered species such as panda, tiger, and elephants. Friends of the earth: It is the largest grassroots network which connects 71 national members from each continent with the active participation of 5,000 local groups campaigning on urgent environmental issues and adopting sustainable practices. Tree people mission: It is a project started in Los Angeles with the sole mission of caring about their neighboring and taking good care of the plants, trees, and environment. Indian solar mission takes a new target of installing approximately 20 Gigawatts of solar capacity by the end of 2020. This has been globally appreciated and idealized. India is counted active under Paris Agreement act especially in controlling the greenhouse issue and promises to adopt sustainable practices using non-fossil fuel power generation by 2030. India’s first national action plan on Climate Change (NAPCC) was found on June 30, 2008, which has been successfully coming up with environmental projects and long-term policies in order to regain the spoilt global image of the country in terms of environmental law and order. This year Diwali was not as loud as it was before for Delhi NCR people.The government banned the sale of crackers and explosives in Delhi because of the dangerous air quality index reports. This year proved to be the best Diwali with the lowest pollution rate in Delhi in 3 years. Sadly, over 3 billion rich people are mainly responsible for wrecking the future of planet earth where, the other half which is the poorer one, would be facing the bitter consequences of this catastrophic scenario. Hence, we need to be better stewards of the planet and take efforts in rebuilding what we have lost and building what we believe would be fruitful for future generations. We are looking at it back to front, look at the graph, while undergoing the Industrial revolution and everyone in Europe with coal fires during a colder period, It hardly changed. It only took off in the 60’s when the bombing started and we have had non stop bombing since and oil wells burning out of control for years. That is the cause of global warming and until it stops there is little we can do about it. Sorry, but we are bombing our planet into oblivion. According to me climate change is a biggest threat all over the world , everybody has been suffering not only thay if we everybody will not careful then near future we will have to face biggest problem, nobody can get relief. Trees maintain the balance of our environment , release oxygen and takes carbon dioxide but trees are hacked to death because of civilization and high rise buildings I e carbon dioxide are increasing but we everybody has to make plantation not only plantation to complete our duty, we have to nurture them then it will be flourished and we have to use environment friendly vehicles. Govt has to take initiative to set up solar energy plant then use electricity can less .In this way we can save our environment. Otherwise near future we have to suffer a lot already sea level increasing, ground water level decreasing and ice getting melted .So we should very careful. Improvement in technology is to save the time not to destroy ourselves, but now it will happen because of increase in population, the needs also increase. it will destroy the nature sources and the result we also at the stage of end of our death point…….try to involve BIOTECHNOLOGY..its way to attach with nature without affecting it so WE CAN SAVE THE NATURE FOR OUR FUTURE.